Exilis is an exciting new technology that uses radio frequency (RF) and high intensity focused ultrasound (HIFU) energy for body and face contouring and skin tightening. It is a non-surgical office procedure that reduces fat and firms skin in the face and body. The Exilis Elite delivers twice the energy of the original Exilis device and offers superior results in a shorter amount of time. During an Exilis treatment, precisely controlled radio frequency energy and focused ultrasound to heat the deeper layers of the skin. This heat causes fat cells to shrink and contracts the skin tissue, stimulating new collagen production in the process. Exilis is recommended for any patient between the ages of 25 and 70+ who desires cosmetic improvement, particularly those areas that show the signs of aging, and have not responded to other treatment options. Exilis treatment offers cosmetic improvement without surgery. As the Exilis device is guided over the area to be treated, you will feel a deep heating sensation. Exilis radio frequency energy is delivered to the deeper layers of the skin. The underside of the applicator provides cooling to the skin’s surface, keeping you more comfortable during the treatment. The Exilis platform was designed to deliver energy in a short treatment of under an hour for greater patient convenience and comfort. Generally, a series of 2-3 treatments will be required to achieve the desired result. The exact number of treatments will depend on your existing cosmetic concerns and the goals you want to achieve. There is no downtime with this procedure. There may be temporary pinkness or redness in the skin for about 20-30 minutes that quickly subsides. Since there is no downtime or special care required once you leave the office, you can carry on with the rest of your day’s activities immediately following treatment. Yes, Exilis is an FDA cleared device for skin tightening There are controls built in to the device to ensure that it does not overheat the skin. You may start to see some skin tightening and facial reduction results after just 1 to 2 Exilis Elite treatment sessions. Treatments will be spaced out over 1 to 2 week intervals. The Exilis Elite is a second generation device that delivers twice the power of the regular Elite model sometimes available through salons or medi-spas therefore less time is needed to achieve optimal results. Can I achieve same results with Exilis as with a facelift or neck-lift? Exilis will not deliver the same results as a surgical facelift or neck-lift. It is a great non-surgical alternative for those who wish to tighten the skin, remove isolated areas of fat from under the chin or face. Exilis may also be used for the enhancement or maintenance of surgical procedures. What areas of the body can be treated with Exilis? 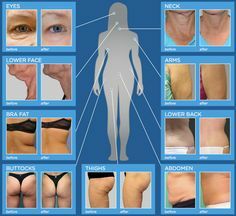 Due to the unique design of Exilis, the neck, face, body, arms and legs, back fat and knees are all treated successfully. Exilis is a relatively new device, but current studies show that those who have had treatment over 2 years ago have maintained their results. Typically, once fat cells have been destroyed they do not come back.